Not so long ago I purchased VeriLook 9.0 Standard SDK. Today there is a new version - VeriLook 10.0 Standard SDK. Is my license suitable for this version? Can I use the same licensed files to work with it? Older licenses are supported with newer version of the SDK. You could also download the SDK from the version you have purchased till the latest one for free of charge. So yes, you could use the licenses. Trial licence expired, In this computer had not installed anything, as it could have the 30 days of test?? Generate diagnostics via Activation Wizard and send it to support@neurotechnology.com. I copied the dlls to the project but still it gives the same error. I also tried to add the dll to the project references directory in visual studio but it gives this error. It still doesn't find native libraries. Run Process Explorer and check from where .NET libraries are loaded(Neurotec. *.dll) by your application, then copy all native libraries from "SDK\Bin\Win*" to that directory. You are trying to add native library as reference to your project, it can't be done, only .NET libraries can be used as references. When you activate licenses via Activation Wizard, those files should be saved in "SDK/Bin/Licenses" folder(if you use SDK structure) or in "Activation/Licenses"(if you moved Activation folder to other location). Your websites says: The Fingerprint Client component is a combination of the Fingerprint Extractor, Fingerprint BSS, Fingerprint Segmenter and Fingerprint WSQ sub-components. It is intended for the systems that need to support most or all functionality of the mentioned components on the same PC. Using these licenses allows to optimize component license costs as well as reduce license management. If you use SDK structure, the licenses must be placed at SDK\Bin\Licenses or at the same folder where application startup path is. If you moved the sample out of the SDK structure or developed you application, copy the licenses you want to use to the same folder where application startup folder is. It is not a must to have the licenses at the application startup folder. You could load the licenses in the source code by using NLicense.Add(LICENSE_READ_AS_STRING) when developing your application. Im having problems with the server/client licence configuration. On my server, I have a dongle with 1 Server licence and some other licences. On the activation wizard I configured: Volume licence manager server. Then, in the client machine (without any dongle), I opened the Activation wizard and configured: Volume licence manager client, setting my server IP and the port 5000. I tried with the local and the external IP. No one licence is loaded in the client machine. Also, my program isnt detecting any licence. What am I doing wrong? Test connection using Telnet e.g. "telnet IP PORT", this way you will test if pg service can be reached via that port. How Can I activate a single comercial license on the Android enviroment? Pedro Rossa wrote: How Can I activate a single comercial license on the Android enviroment? Instructions can be found in "SDK\Documentation\Activation.pdf" in paragraph: "2.4 Activation for Android". We have an issue, we need to generate a Single Computer licence,so in the process we could generate the serial number with the Activation Wizard (Windows) and the dongle, but we are going to install the licences in a Linux envioment (Centos 6.9) so we can"t use the Activation Wizard (only works in Windows ) to obtain the hardware ID. Finally we could do the "License generation" part in a Windows, but of course we can"t do it without the hardaware id. So the question is, How to obtain the hardware id in Linux? We could install windows in that Server and obtain the hardaware ID, but, it will work the obtained license when we change the O.S. to linux? I recently just installed 30 trial for the SDKs that includes fingerprint,voice and other biometric systems. After setting up the application using setup.I didn"t activate any licenses since it was working for my friend without problems . I tried accessing the sample programs from the bin/windows x86 folder. 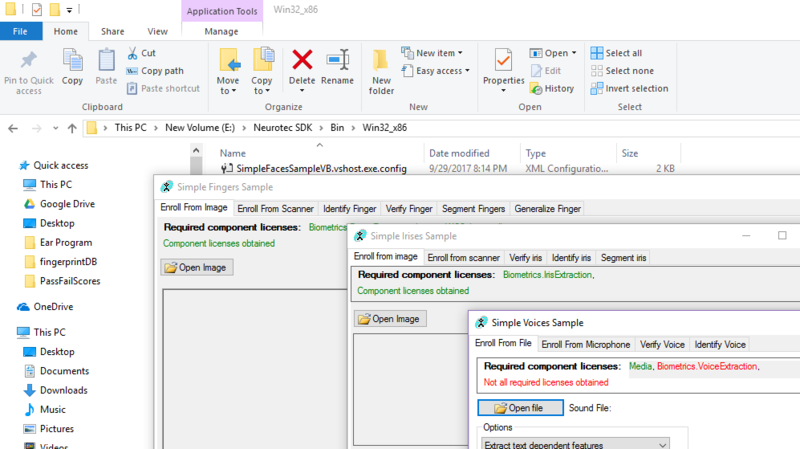 The voice sample program doesn"t work, it says "Not all licenses are obtained", however the other sample programs work just fine . What am i missing it says "Biometics.Voice extraction" in red? Generate diagnostics via Activation Wizard(located in "SDK\Bin\Win*\Activation") and send it to support@neurotechnology.com with issue description. I am trying to use Volume licence manager as a dongle( which has several licences) on Virtual Machine Esxi 5.5, but i can"t achieve so there is no avaliable USB device. 2. Connect dongle to some computer, configure licensing service to share licenses over the network and start it (VLM Server). Then you could configure licensing service on VLM client (virtual machine) to obtain licenses from VLM Server. Hi,I am developing in Windows ASP.Net, can I use this license for a new project in Android? David F wrote: Hi,I am developing in Windows ASP.Net, can I use this license for a new project in Android? What license exactly? Are you asking if you can use PC licenses in Android? Or you asking if you can move licenses from one machine to other? hello, i have usb dongle for verilook sdk. but when i tried to activate, the dongle status is always disconected. 4.2 version of the SDK, was released prior Windows 8/8.1/10 release, where Microsoft changed the API of HID devices. So old versions of the SDK, as in your case, do not see the dongle if it is used on recent Windows operating systems. The solution for this would be to download recent version of the SDK and copy only the Activation folder from it. Licensing service will see the dongle on new operating system and you will be able to get the license in your application too. Hello, I have purchased the VeriFinger 10.0 Standard SDK with the fingerprint extractor and the fingerprint matcher, I tried to activate the license but after using the activation wizard with .lic files we did not manage to use the SDK, what should I do? Can you tell me whether the activation uses .sn files, .lic files, or both? Can you verify that Im putting them in the correct directory, and have the correct settings on the Licensing Server tab? .sn files are serial number files. They are used to activate the license and generate license file (.lic). NLicensing library uses only .lic files to enable SDK functionality. In case of Android copy these license files to /sdcard/Neurotechnology/Licenses folder, then application will find them automatically. If you want to copy them to any other folder, then you will need to use NLicense.add() method to pass the license content to NLicensing library. I"ve read a little bit and got 2 questions. 1st if i buy a verilook standard sdk , and I make a tool with it , is it possible to run the tool on another machine ? without buying another license ? its giving me no error my trial sdk is running ist connected .. where do i have to put the Nlicensing.cfg file so it will be read ?? luckyluke1977 wrote: 1st if i buy a verilook standard sdk , and I make a tool with it , is it possible to run the tool on another machine ? without buying another license ? Yes, you can move license from one computer to another, but note that the same license can be used on single machine only at the same time. To use on multiple machines concurrently, you need multiple licenses e.g. for 5 machines to perform extraction, you will need 5 Face Extractor licenses. Generate diagnostics via Activation Wizard and send it to support@neurotechnology.com with issue description. We are going to use your VeriLook SDK for a project, but before buying it, we are using the Trial version to test it for our needs. I"m writing the project in C#, I"ve used the Activation Wizard to activate the VeriLook SDK, but when I use it, it says that it can"t obtain "Face Extractor", "Face Client" and "Face Matcher". It was working at some point, then it stopped working, and now it isn"t working again. It only obtains the "Face Capturer" and "Devices.Camera", but we need the rest as well. Use Activation Wizard and generate the diagnostic and send it to support@neurotechnology.com with issue description. can i use digital persona u.are.u 5160 with any tablets? If yes then what"s the procedure? AsimAslam wrote: can i use digital persona u.are.u 5160 with any tablets? If yes then what"s the procedure? Digital Persona devices are not supported on Android in our SDK. I would like to test VeriFinger SDK on Linux, but I have trouble to obtain trial licence. I see that for Windows it could be obtained in few clicks with Activation wizard. What is <serial_number_file> here? Do I need it for trial licence? Is it possible to activate trial licence for Linux / Mac OS X at all? if you want to use a trial version of the SDK on Linux, then you should enable the trial mode in your code as it is shown in tutorials and samples of the SDK, included in the downloaded SDK zip file. To run trial version Neurotechnology licensing service on some remote real machine. And the trial version of the Neurotechnology licensing service on virtual machine is configured as gateway and points to this real machine, mentioned in previous step.